This region is the coastal playground for West Australians. It is easily accessible and located just a few hours drive south of Perth. The Festival of Busselton Festival of Busselton is held every January throughout the City of Busselton. Events range from outdoor cinemas, a log chop, children's treasure hunt and chalk art competition, float parade, sand castle competition, a fishing clinic and many more community events, almost all of which are free or request just a gold coin donation. Our most popular event is Petticoat Lane when Busselton's CBD is closed for the evening and up to 8000 people scan the 200 stalls for bargains or food. Our free Closing Night Concert features Aussie rock icon Daryl Braithwaite live on stage with a great fireworks display to bring an end to the major Festival events. Busselton in January is one big festival, with over 150 community and other events held throughout the month, so come along and join in the fun. 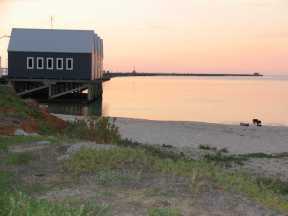 Geographe Bay has always enjoyed an enviable reputation as a superb seaside destination for family holidays. A growing number of interstate and international visitors are also discovering the magic of the area – superb coastline, temperate climate and national parks combined with the enormous range of visitor facilities and attractions. The region caters for all visitors-holiday makers, business people and those visiting friends and relatives. Local people are working hard to ensure that the natural beauty and magic of the area is maintained for future generations through groups like the Smith Beach Action Group . The seaside towns of Busselton and Dunsborough are nestled along the wide sandy shores of Geographe Bay. The calm beaches of the Bay are protected from prevailing winds, and are popular with swimmers, fishermen, scuba divers and snorkellers. Busselton & Dunsborough townsites provide excellent shopping and service facilities. Both towns have held the prestigious title of WA’s top tourism town. Yallingup is situated on the western side of Cape Naturaliste, and features beautiful rugged cliffs, rolling green hills and native bushland. Yallingup is world famous for its excellent surf breaks and the sandy beaches and coves. A wide range of accommodation is available - from caravan, camping and chalet parks to serviced apartments, resorts, luxury retreats and B&Bs. Many of the resorts and restaurants have well equipped convention and function facilities perfect for weddings, seminars, conferences and expos. Visitors can experience the huge array of tours, wineries, award winning restaurants and chefs serving the best local produce. There are over 80 wineries in the Margaret River Wine Region providing tastings and sales from the cellar door. Most are within a one hour radius of Dunsborough. Meet the people who make the wine, or enjoy the superb cuisine available from the many winery cafes or restaurants. Geographe Bay hosts many local and international events, such as the Western Australia Ironman, Busselton Beach Festival, Festival of Busselton, The Bluewater Classic, Geographe Bay Raceweek, The Busselton Jetty Swim, Leeuwin Estate Concert, Forest Rally, Festival of Triathlon and the Margaret River Wine Region Festival. Events are regularly updated on the Geographe Bay Tourism Association website: www.geographebay.com . When you come to Busselton, you are coming to one of the world's great winemaking regions. Be it the intense Chardonnay's, rich Semillons, robust cabernets or soft Merlots. Busselton wines have a reputation for distinguished character and quality and have been awarded numerous Australian and international awards. While you're here take the time to enjoy not only the wines, but also their heritage and the picturesque countryside. Enjoy your West Australian holiday. Barry Green, Managing Director, Western Tourist Radio.